Name Variation Louis Lange was also known as Lewis. Louis Lange was born on 28 July 1893 at Nebraska. Louis Lange died in December 1964 at age 71. Name Variation John Lange was also known as Johnny. John Lange was born on 25 December 1895 at Nebraska also reported as Dec 1896. John Lange died in December 1970. Married Name 5 June 1951 As of 5 June 1951,her married name was Lange. Rita Ann Lammers was born on 11 March 1925 at Nebraska. She was the daughter of Ignatz F. Lammers and Gertrude L. Walz. Rita Ann Lammers married Virgil A. Lange, son of August F. Lange and Ludvina Gertrude Kleinschmit, on 5 June 1951. Rita Ann Lammers died on 23 July 2009 at age 84 Rita Ann Lange, age 84, of Fordyce, Nebraska, died on Thursday, July 23, 2009 at Heritage of Bel Air in Norfolk. Mass of Christian Burial will be on Tuesday, July 28, 2009 at 10:30 am at St. John the Baptist Catholic Church in Fordyce with Rev David Fulton and Rev. Ralph Lammers officiating. Burial will be in St. John the Baptist Cemetery in Fordyce. Visitation will be on Monday from 1:00 to 5:00 pm with a rosary at 2:00 pm at the Wintz Funeral Home in Hartington. There will be a Vigil Service on Monday at 7:00 pm at the church. Visitation will continue one hour prior to services on Tuesday at the church. Pallbearers will be her grandchildren, Rose and Warren Anderson, Jennifer Lange, Lisa Lange, Michael Lange, Thomas Lange, Seth and Margaret Lange, Dana Lange, Joel Lange and Jackson Lange. Honorary pallbearers will be her great grandchildren, Sophia and Ian Anderson. Rita Ann Lammers was born on March 11, 1925 in Fordyce to Ignatius and Gertrude (Walz) Lammers. She grew up in Fordyce and graduated for Holy Trinity High School in 1943. After graduation, Rita taught at several country schools in Cedar and Knox Counties. She studied education at Wayne State College in Wayne, Nebraska. On June 5, 1951 Rita married Virgil A. Lange at St. John the Baptist Catholic Church in Fordyce. In 1955, they built their home in Fordyce and lived there over 50 years. Rita was a dedicated, stay-at-home mother until all her children had graduated from high school. She was a wonderful cook and baker; her pies and homemade bread will be missed. Rita also worked at the bank in Fordyce until she retired. She spent many of her later years visiting her siblings, her children and her grandchildren throughout the country. Rita was a lifelong member of St. John the Baptist Catholic Church and was active in the Ladies Guild and the Christian Mothers. She loved and cared for her children, grandchildren, and great grandchildren. Rita was dedicated to her faith and often walked the four blocks to and from church for daily mass of for adoration. Rita is survived by 7 children and their spouses and partners, Ann L. Lange and Cliff Chase of Seattle, Washington; James and Connie Lange of Norfolk; Dr. Steven H. and Graciela Lange of Bellevue, Washington; William E. Lange of Papillion, Nebraska; Dr. Richard Lange of Woodridge, Illinois; Ellen Lange of Omaha; Joseph Lange and Diane McNary of Overland Park, Kansas; 9 grandchildren, 2 great grandchildren, 3 sisters, Dorothy Lammers and Alice Lammers both of Omaha; Helen Soukup of Minneapolis; and 1 brother, Rev. Ralph Lammers. She was preceded in death by her parents, husband, Virgil on April 17, 2009 at the age of 82, 3 brothers, Charles Lammers, Arthur Lammers and an infant, and 1 sister, Betty Webb. Memorials are suggested to St. John the Baptist Church in Fordyce, Cedar Catholic High School Education Foundation, or for Alzheimer's research. Name Variation Francis Lee Pflanz was also known as Phlanz. Francis Lee Pflanz was born on 10 January 1934 at Nebraska. He was the son of Edward Pflanz and Mabel Fish. Francis Lee Pflanz died on 3 February 2012 at age 78 Francis Lee Pflanz, 78, of Dakota City, NE passed away on Friday, February 3, 2012 at Regency Square Care Center in South Sioux City, NE. Services will be held at 11:00 A.M. on Thursday, February 9, 2012 at the Mohr Funeral Home, 1431 W. 29th Street, South Sioux City, NE with Father Oscar Perez officiating. Burial will be in the Belden Cemetery in Belden, NE. Visitation will begin at 5:00 P.M., with the family present at 6:00 P.M. and a Rosary at 7:00 P.M. on Wednesday, February 8, 2012 at the funeral home. Francis was born in rural Belden, NE on January 10, 1934, the son of Edward and Mabel (Fish) Pflanz. He grew up in the Belden area and graduated from Belden High School. He worked for the Burlington Northern Santa Fe Railroad. Francis was also a medic in the Naval Reserve. He married Severa Lange at St. Michael's Catholic Church in Coleridge, NE. The couple lived in Belden, then Worden, Montana before Francis moved back to Dakota City, NE, due to a job transfer. After 42 years with the railroad, he retired and volunteered at the South Sioux City Senior Center where he delivered meals on wheels. He also volunteered at the South Sioux City Eagles Club. Francis was a lifetime member of the Dakota City American Legion and the South Sioux City Eagles Club. He enjoyed fishing, hunting deer and elk, and was an accomplished mechanic. He was very generous, always there to lend a helping hand. Francis especially loved his cat, Kelli. Survivors include his wife, Severa of Worden, MT; 3 sons, Charles Pflanz of Belton, MO, Douglas Pflanz of Andover, KS and Marti Pflanz of Aliso Viejo, CA; 2 grandsons, Travis and Nathan Pflanz; brother, Donnovan (Rosemary) Pflanz of Norfolk, NE; sister, Virginia (Gene) Magden of Sioux City, IA; special nieces and nephews, Dennis and Jeffrey Magden, Lori (Donny) and Cash Bratetic, Lisa (Craig) and Colin Campbell; and many other nieces and nephews. Francis was preceded in death by his parents, Edward and Mabel Pflanz. Henry G. Lange was born in October 1878 at Nebraska. Frank Lange was born in July 1880 at Nebraska. Amanda Lange was born in June 1882 at Nebraska. She was the daughter of John Henry Lange and Christina Foecke. Mary Lange was born in July 1884 at Nebraska. Herman Henry Witte was born on 15 January 1865 at Iowa. He was the son of Herman Witte and Gertrude Rupiper. Herman Henry Witte died on 10 March 1865. Mary Witte was born on 14 January 1864 at Iowa. Mary Witte died in 1882. [S246] U.S. Federal Census 1880 U.S. Federal Census, by Ancestry.com, NA Film Number T9-0744 Page Number 317A. Bernard J. Witte was born on 28 February 1870 at Nebraska. Bernard J. Witte married Elizabeth Hoesing, daughter of John Hoesing and Katie (? ), circa 1904. Bernard J. Witte died on 2 December 1940 at age 70. 1910 Zell, Faulk, South Dakota Bernard J. Witte was listed as the head of a family on the 1910 Census at Zell, Faulk, South Dakota. [S245] U.S. Federal Census 1900 U.S. Federal Census, by Ancestry.com, ED34. Dwelling 99. Name Variation Elizabeth Hoesing was also known as Lizzie. Married Name circa 1904 As of circa 1904,her married name was Witte. Elizabeth Hoesing was born in May 1880 at Nebraska. She was the daughter of John Hoesing and Katie (?). Elizabeth Hoesing married Bernard J. Witte, son of Herman Witte and Gertrude Rupiper, circa 1904. 1910 Zell, Faulk, South Dakota Elizabeth Hoesing was listed as wife in Bernard J. Witte's household on the 1910 Census at Zell, Faulk, South Dakota. Name Variation William B. Witte was also known as W. B.
William B. Witte was born on 25 January 1871 at Nebraska or Iowa also reported as circa 1868. William B. Witte died before 1957. On 19 January 1938 at Mrs. Gertrude Kleinschmit visiting brothers J. J. Witte and W. B. Witte. Herman Witte was born on 22 March 1872 at Nebraska. Herman Witte died on 28 September 1944 at age 72. Name Variation Katherine Witte was also known as Kate. Married Name 11 September 1894 As of 11 September 1894,her married name was Roth. Katherine Witte was born on 10 December 1873 at Nebraska. Katherine Witte married Henry Roth on 11 September 1894. Katherine Witte died on 5 November 1918 at died from the flu at age 44. Henry Roth married Katherine Witte, daughter of Herman Witte and Gertrude Rupiper, on 11 September 1894. Married Name 9 May 1895 As of 9 May 1895,her married name was Tramp. Anna Witte was born on 21 January 1876 at Nebraska. Anna Witte married Frank Tramp on 9 May 1895. Anna Witte died on 17 March 1941 at South Dakota at age 65. Frank Tramp married Anna Witte, daughter of Herman Witte and Gertrude Rupiper, on 9 May 1895. 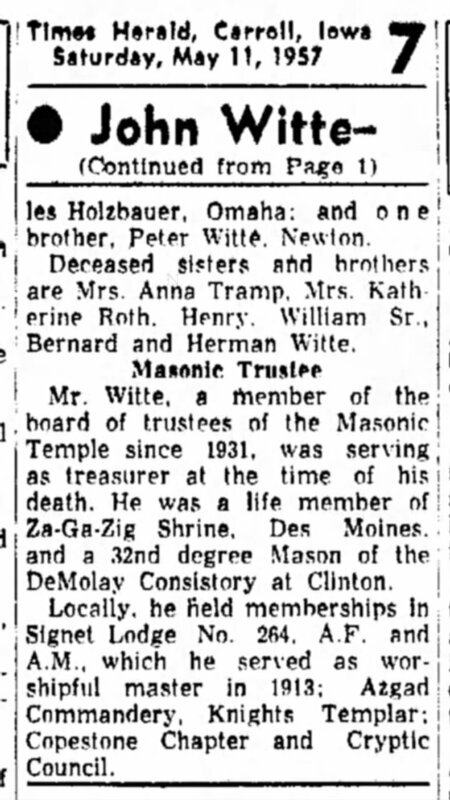 Henry Witte was born in March 1883 at Nebraska. Henry Witte died in 1908 at died from appendix. Married Name Her married name was Holzbower. Agatha Witte was born on 5 February 1885 at Nebraska. Agatha Witte died on 25 April 1959 at age 74. 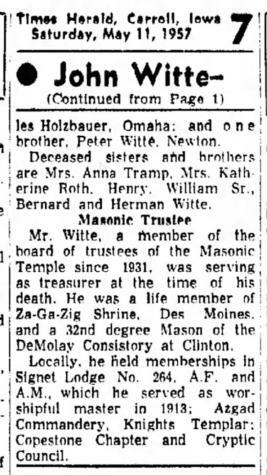 Peter Witte was born on 9 November 1887 at Nebraska also reported as Oct 1887. Peter Witte died on 31 May 1966 at age 78. Name Variation John Joseph Witte was also known as J. J.
John Joseph Witte was born on 11 February 1879 at Nebraska. John Joseph Witte married Mabel C. Lowry on 12 June 1906. John Joseph Witte died on 11 May 1957 at age 78. Name Variation Mabel C. Lowry was also known as Loury. Married Name 12 June 1906 As of 12 June 1906,her married name was Witte. Mabel C. Lowry married John Joseph Witte, son of Herman Witte and Gertrude Rupiper, on 12 June 1906. Name Variation Jacob E. Kleinschmit was also known as Jake. Jacob E. Kleinschmit was born on 15 August 1901 at Nebraska. Jacob E. Kleinschmit married Anna Mary Lenzen in 1922 at Cedar, Nebraska, license issued Oct. 14, 1922. Henry Matthew Kleinschmit was born in 1905 at Nebraska. Henry Matthew Kleinschmit married Elizabeth Mary Kuchta, daughter of Joseph Kuchta Jr. and Mariam Anna Kast, after 1930. Henry Matthew Kleinschmit died on 9 August 1982. Married Name 6 May 1902 As of 6 May 1902,her married name was Kleinschmit. Mary K. Goeden was born on 9 October 1877 at Nebraska. She married Jacob Kleinschmit, son of Johann Peter Kleinschmit and Elizabeth Schaefer, on 6 May 1902 at Cedar, Nebraska, license issued May 2, 1902. Mary K. Goeden died on 20 March 1969 at Nebraska at age 91. John William Arens was born in September 1893 at Nebraska. He was the son of Franz Joseph Arens and Mary Kleinschmit. John William Arens married Caroline Mary Luft circa 1915. Mary Arens was born in November 1895 at Nebraska. She was the daughter of Franz Joseph Arens and Mary Kleinschmit. Joseph Arens was born in September 1897 at Nebraska. Ida Arens was born in March 1899 at Nebraska.